The lemon drop martini is one of those great vodka martinis that highlight modern martini menus. It's so popular, in fact, that it has inspired a number of ready-to-drink variations. However, the recipe is so easy that those are not needed. Like many of the best cocktails, the lemon drop martini requires just a few ingredients. You'll choose your favorite vodka and shake that with lemon juice and simple syrup. Really, that's it! This is a great dessert drink and a fabulous choice when you want a cocktail with a bit of pucker and a hint of sweetness. You can also adapt it to suit your personal taste and have fun adding other fruit flavors to the mix. In a cocktail shaker filled with ice, combine the ingredients. Simple drinks like this deserve—and almost require—the best ingredients. The foundation is vodka, so begin building the best tasting cocktail possible by choosing a smooth vodka. There are many fantastic premium vodkas to choose from and, if your budget is a little tight, you can also find some nice options within the less expensive vodkas. To get the absolute best lemon drop, the lemon juice and syrup should both be fresh. Neither fresh juice or homemade syrup is difficult to make or store and the difference in taste proves that they're worth it. If you find the drink to be a little too tart, add more syrup next time. Likewise, if it's a bit too sweet for your taste, pour more lemon juice. The limoncello is a fun addition, but it's not absolutely necessary. If you don't have it, make the lemon drop with juice and syrup alone, and that's when you might want to increase the syrup to make up for the sweetness. 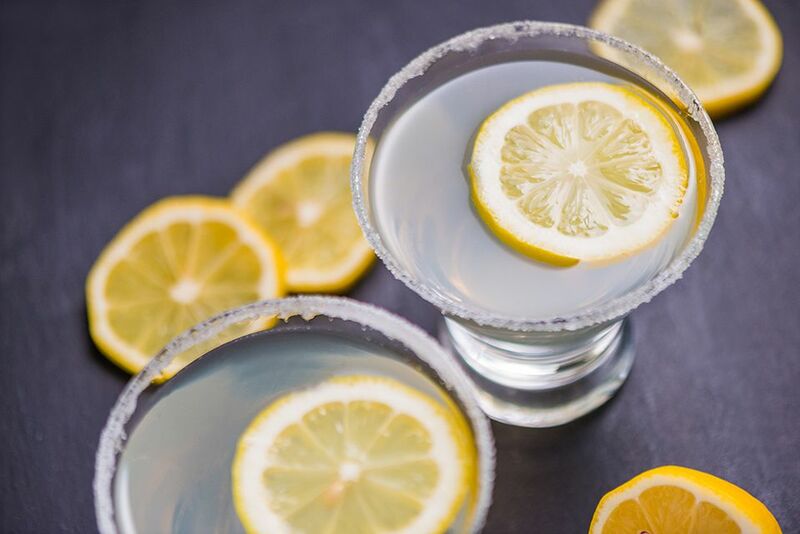 Quite often, the lemon drop is served with a sugar rim: Wipe a lemon wedge around the glass to wet the surface before dipping it in a small dish of white sugar, then mix up the drink. This is a brilliant introduction to the sweet and sour drink you're about to sip! This recipe is the perfect base for experimentation and it is very easy to add hints of extra fruity flavors. The easiest ways are to use a flavored vodka or make your own flavored syrup. Citrus and other fruit vodkas are a popular choice and offer the ease of exploring different flavors effortlessly. Floral syrups can also add a fun twist. For instance, a lavender simple syrup creates a lovely lavender lemon drop martini. In spring, you can get a similar flavor by harvesting those beautiful lilac blooms and creating a lilac lemon drop martini. Another simple variation to the original recipe is to add 1/4 ounce Cointreau and use only 1/2 teaspoon simple syrup. This brings in an orange undertone that really complements the sweetened lemon. If you're in the mood for a shot rather than a martini, the lemon drop shot offers the same great flavor combinations in an interactive shooter that's quite fun. Lemon drop martini mixes are, essentially, a lemon sour—sweetened lemon juice in a convenient pour-and-shake package. You can replicate that by making a fresh lemon sour at home. Simply skip the lime juice in a standard sour mix recipe and replace the volume with lemon juice. The advantage of pouring lemon juice and simple syrup separately is that you can adjust the sweet and sour to taste. You can still get that customization in a DIY lemon sour. Take notes while mixing up the martini with the individual ingredients until you find your ideal balance. You can then take that same ratio into making your lemon sour and bottle it. This makes it even easier to enjoy a lemon drop anytime you like. How Strong Is a Lemon Drop Martini? The lemon drop martini has an alcohol content that's typical of fruity vodka martinis. On average, it should shake up to about 20 percent ABV (40 proof), which is half the strength of a straight shot of vodka. Keep this in mind because the cocktail's sweet taste makes it easy to drink one too many!